In case you missed it: People really, really want virtual reality (VR) to become a mainstream technology. At least, one person in particular does. That would be Mark Zuckerberg, CEO of Facebook — who at the 2017 Oculus Connect developer conference announced his lofty vision of one billion people using VR. Of course, there’s a backstory. In 2014, Facebook acquired Oculus: a maker of VR hardware, like headsets. Since then, the company has made efforts to make virtual reality more mainstream, like introducing its “affordable” ($199) wireless, standalone headset, the Oculus Go. So, what’s stopping VR from going mainstream? After all, at a minimum, it’s fun to play with. The use cases for education via VR have been lauded by some. And as headset technology continues to improve, so will the experience of using VR for many. We decided to find out, and asked hundreds of users for their thoughts on VR. Here’s what we found. 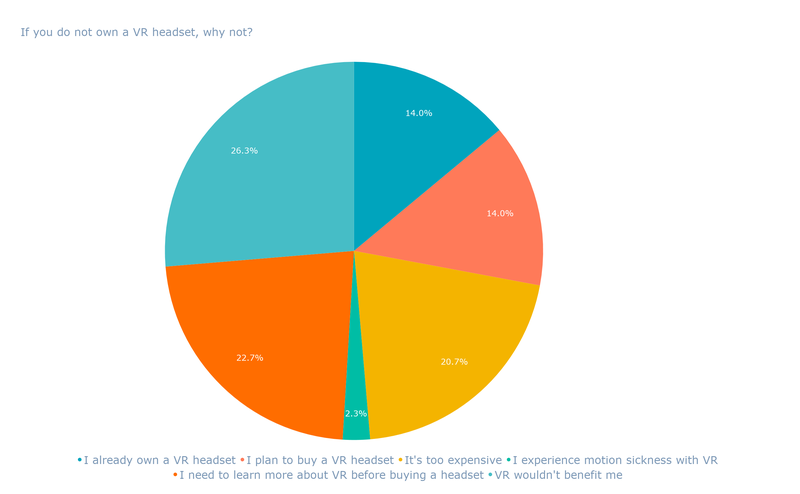 We asked 745 people across the U.S., UK, and Canada: If you do not own a VR headset, why not? The highest number of respondents — 27% — indicated that they do not own a VR headset because it “wouldn’t benefit” them. This response could indicate that use cases for VR remain unclear — and, therefore, so does the value it could add to the user’s day-to-day life. These findings align with those for a second question we asked of 773 people across the same region: If you owned a virtual reality (VR) headset, what would you use it for the most? Nearly half of respondents — about 41% — said that they would primarily use this hardware for gaming, which is generally a leisure activity that’s available through a number of other platforms that might be seen as more accessible than a VR headset. That brings us to another possible barrier to VR’s mainstream market permeation. 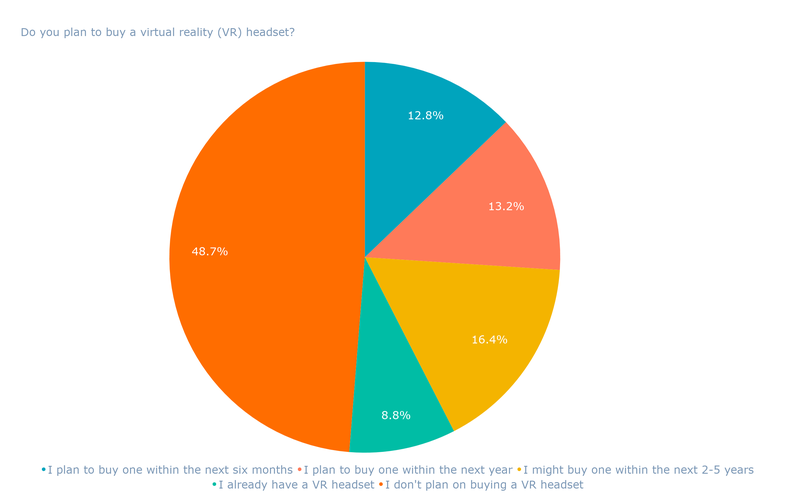 In addition to a seeming misunderstanding of VR’s value proposition, about 21% of survey respondents indicated that they don’t own a VR headset because it’s too expensive. Those findings align with the aforementioned point about gaming serving as the primary use case for VR. Gaming is available across a broad range of platforms, ranging from most smartphones to high-end standalone consoles, like Xbox products. Consider that, currently, the most expensive Xbox console is priced at $499, and the Rift, the most expensive Oculus headset, is $399. Sure, the Xbox console is more expensive. However, its name comes with a bit more brand recognition than Oculus, a fairly new name in what’s already an emerging area of technology. And, as a partial result, the purpose of the Xbox — playing video games — is fairly explicit. The general purpose of any VR headset, meanwhile, seems to be less clear — perhaps because fewer people have had the opportunity to use it. One of its key differentiators from other gaming platforms, however, is the immersive, 360-degree experience it offers, which could serve as a channel to more widespread consumption. That response points to the idea that VR still remains an emerging, new technology that most users have yet to experience — unlike traditional video games or social media, of which most users now have a clear understanding of their purposes. But as we saw with our second survey question, that’s not the case with virtual reality — and many people don’t understand what purpose it would serve in their homes or their lives. However, that may not always be the case. When we posed our question about what users would do with a VR headset, should they own one, the responses beyond “gaming” were diverse — with a fair amount of respondents indicating that they would use VR to watching movies or TV shows, explore a new place, connect with distant friends and family, or learn a new skill. And as more users begin to understand the purpose of VR — and the hardware is scaled to an increasingly accessible price point — its use cases may not even be so flashy in the future, causing it to potentially follow a similar path as the smartphone. So, will that happen in the immediate future? Probably not, Mealy believes — but it’s an eventual reality.